I’m getting ready to go on a tour of New Orleans, then pop on a flight home. I’ve enjoyed this weekend. Tuesday, I go back to Ireland and, somehow, I need to do all those things that I need to do for a getaway. So, by the time you read this, I will be in Galway. And that is always good. The food in New Orleans is fabulous. There is something magical about this place and I always enjoy my time. I still need to do the “Confederacy of Dunces Tour,” which is a great book about New Orleans, and I love to wander around here. I average six miles a day here (iPhone App says so!) and love the music. Ireland, of course, is an epic walking tour country, so I will get my miles in. I travel now with a hip band and Judo belt for isometric work. These are light and easy to pack and they keep me going a bit. Nothing too fancy, no, but it works. I’ve been trying to figure out how to train on the road my whole life. Bouncing around the internet, I found this online this week. Thirty years ago, I discovered the book Debt Free Millionaire and this site does a nice job summarizing the materials. Hint: it works. This article really fascinated me. I’m from the Great Books tradition and we were raised reading, discussing and debating. It has allowed me to think through some things that some people might just huff and puff and growl around with no results. Teare: Based upon your experience with professionals in various businesses, what would your recommendation be with regard to the undergraduate educations of college students? Ager: My recommendation would be to ensure undergraduate educations teach methods of inquiry and of communicating findings. My eldest daughter’s liberal arts education did just that, and she is translating that into a career in data analytics. Markus Wessel sent this in and I enjoyed it. It’s worth your time. It’s estimated that about half of marriages end in divorce. Why are so many people getting divorced, and how can you prevent splitting up with your spouse? We asked four divorce lawyers what they’ve learned in their practice on how to keep your marriage alive. I really enjoyed this article. I know nothing about this runner, but it is a fascinating read. Kawauchi tries to sleep at least seven and a half hours a night. And he incorporates ultralong runs into his training to build stamina. He has been known to jog the distance of a marathon three times in a week and to run 62 miles, or 100 kilometers, along a river to his home in seven and a half hours. Will Kawauchi will run faster when he quits his job and becomes a full-time runner next April? Will more training miles leave him hurt more often, and less resilient in recovery? It remains to be seen. The 2020 Tokyo Olympics are approaching, but ever the contrarian, Kawauchi said he was not interested. He has struggled running in heat and humidity. It would be a waste, he said, to prepare for the brutal conditions expected in August in Tokyo. “The Olympics aren’t the only destination an athlete should go for,” Kawauchi said. He has broader ambitions: To run another personal best in the marathon. To win a medal at the 2021 world track and field championships in Eugene, Ore., where the weather figures to be more accommodating. To run as many marathons in as many countries as possible. Unbound by a civil servant’s job, he will be free to go off and see the world as he pleases. As a boy, Kawauchi loved to thumb through atlases and read train schedules. But when he began to run, his world turned inward. He said he thought of little but trying to follow his coach’s plan perfectly. Now he makes his own plan, longs to try new things, see new places. I never heard anything after this interview, but it is pretty good. I enjoyed listening to it. Well, next week, I begin my reports from Ireland. Until then, keep on lifting and learning. 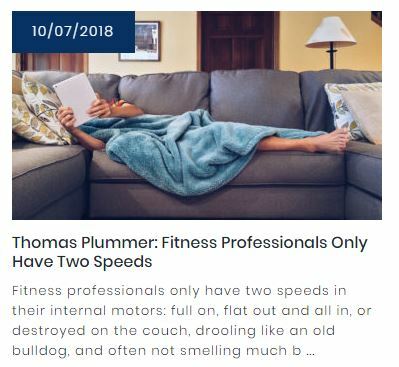 Fitness professionals, as well as many other driven people attempting to create a career and a life, are always worn out physically, and most importantly, mentally because they never learn how to rest both body and soul. “What shall we see?” asked the Wart. Well, this section is just a delight. We knew about Merlyn’s time and life issues (he lives backward in time), but this reading takes his issue to a new level. I just love the “little nap” discussion. White’s humor tends to be situational; he tends to set his characters into funny situations and letting the humor unfold. In this selection, Merlyn’s excitement about taking a nap just strikes me as funny. I’ve been there a few times: long days, humid days, rough sleep and I want to do is take a nap. Merlyn’s enthusiasm just makes me smile. And that is it for the chapter. Not much happens here, but our next three chapters will introduce a lot of new characters and a great story.